Since Williams announced Jenson Button as their second driver in 2000, a number of drivers have come on the record with their opinions, and some have been less than flattering. 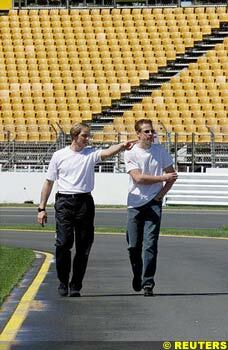 Sauber's Mika Salo believes Button will be a liability. Stepping from F3 to F1 is non-trivial, and Salo thinks that Button's inexperience is likely to lead to accidents: in particular, at race starts and under breaking from 200 mph wheel to wheel with an opponent, he does not trust the youngster. Martin Brundle is the latest to speak out, though for different reasons: his concerns for Button relate to the quality of the equipment he can expect to drive this year. If, like Zanardi last year, Button spends most of his season walking in from a broken down car, courtesy of the new BMW partnership, it can do him no great service. At root, that pretty well sums it up. Salo's concerns have been mirrored by Button himself - he was running another year in F3, rather than looking for an F3000 role, because a poor year in the latter formula would certainly have marked the limit of his racing career's progress. That said, having tested the Williams, he discovered that Formula One is within his capacity. Compared to F1, the car is substantially more powerful, and has plenty of grip... but in essence, is still just a racing car. Button has spent two years in open top racing. Between the step from karting to Formula Ford, then to Formula 3, he has demonstrated his ability to change category, albeit making mistakes on the way. There is no denying Formula One will be difficult, and that there is no room for "beginners" errors: if he is involved in race start pileups, then inexperience will count against him, and blame will follow, wherever it should really be placed. 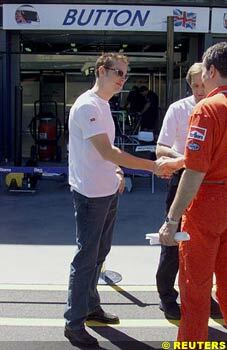 The man he's partnering in 2000, Ralf Schumacher, had similar comments levelled against him when he started. Few would be surprised if this youngster makes the same impact! With Honda's formal comeback in Formula One, things are really hotting up in the engine department. The leading competition - Mercedes, Renault and Ferrari - are all very aware of the comapany's pedigree, and the approach they take to competition. Across the pond, Toyota has gathered some respectability in CART, getting Ganassi racing to switch to their units for this season - quite a coup, considering the engine has been considered the poorest for years. However, development at the tail end of 1999 saw a significant improvement in power and reliability, bringing it on a par with the competition. The implications for Formula One are clear. Whilst V8 turbo and V10 normally aspirated engines are not identical, Toyota are clearly laying out their stall for the development potential they can gather for their projects. Their biggest rival is Honda, but ultimately they intend to produce better engines than Mercedes, Ford and Ferrari, the current leaders in Formula One. Pressed for information on how they intend to meet this threat, the leading manufacturers are presenting a relaxed image: they are already developing flat out attempting to stay ahead of each other, and publicly at least, anticipate Toyota taking years to catch up. It is not so simple, however. Rumours of Renaults interest in returning are still prevalent, and for some reason. The French giant has spent significant money on Research and Development since quitting Formula One, and would be prepared to come back with an all new, cutting edge engine, if they could get their new concept to run. It is believed that the manufacturer's research into low cooling engines is paying off, and something could come of it in the next year or so. Mercedes and Ferrari might present a cool exterior to the world, but they, and to a lesser extend Ford, are really working to gear up development, in order to make a breakthrough of there own, before being deposed by the upstarts. Coral International will sponsor Arrows over the coming two seasons. Also sponsoring Manchester United, the Bookmaker sees these deals as a means to extend their penetration worldwide, and with their new onshore internet betting system. Alongside the existing offshore site, Coral anticipate as much as a 30% up-turn in trade as a result of the deals with Arrows and Man U.
Prost are placing the blame for pre-season difficulties firmly at the door of Peugeot, stating the engine manufacturer's late delivery of the engine is responsible for teething trouble with the car. The new unit does not carry all the promised features, and its late delivery has prevented Prost from isolating difficulties with their electronics... nevertheless, Prost are optimistic for the longer term. Minardi are looking forward to May, when their first engine evolution is expected to come through. The Italian minnows are running as slightly modified '99 spec engine until then, leaving them in the unenviable position of the heaviest and least powerful unit on the grid... however, the engine has proven reliability, which gives them some hope for Melbourne. In the run-up to the new season, the general consensus from past champions, including Scheckter, Stewart and Mansell, is that this will be Schumacher's year. Few are prepared to stick their necks out on the Constructor's Championship, but all expect it to be close. 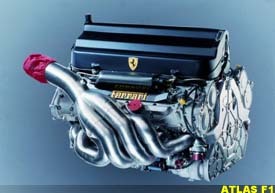 F1 Rumors © 2000 Kaizar.Com, Incorporated.